Inspired by true events and facts and coming from the makers of Tumhari Sulu, Neerja and Raid, the forthcoming Cheat India starring Emraan Hashmi will bare the malpractices in India’s education system. 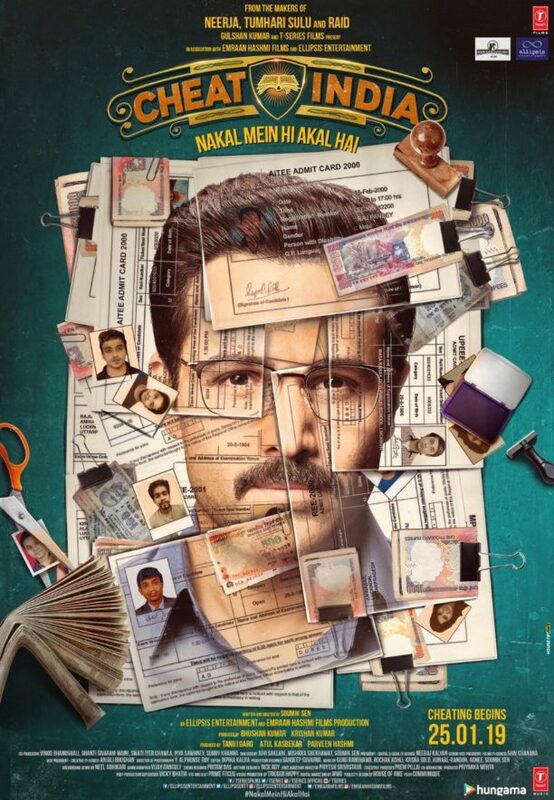 To begin the excitement there was the release of the Cheat India poster, which, as you can see, has Emraan Hashmi’s face stitched together by an assortment of exam admission cards and rupee notes. The intriguing creative led to endless speculation about his character in the film. Then today saw the release of the teaser of the film, which has audiences even more intrigued and eager to see more! Produced by Bhushan Kumar’s T-Series, Tanuj Garg and Atul Kasbekar’s Ellipsis Entertainment, and Emraan Hashmi Films, Cheat India is due for a world release on January 25, 2019. 15 queries in 1.147 seconds.